In this area of the Apparel Search fashion brand directory, you will find children's fashion brands from leading apparel companies and fashion designers. On this particular page, you will find information regarding children's clothing with the Marmot brand. You are welcome to utilize this section of our clothing guide to review Marmot news, Marmot blog posts, Marmot photos, and more. Please understand that you may run into a few photos or a tad of information that does not actually pertain to the children's Marmot fashion brand. Unfortunately, no search technology is absolutely perfect... We will continue to do our best to bring you as much information about the children's Marmot fashion collection as possible. Everything your adventure needs to hit the slopes and explore the trails. In April 1971, University of California Santa Cruz students Eric Reynolds and Dave Huntley were in Alaska's Juneau Icefield on a school Glaciology project. It was there on a glacier that the idea of a Marmot Club began. To become a Marmot, you had to climb a glaciated peak with another Marmot. One of the rules of the club was that everyone was President. Most of the other rules dealt with a collegiate fascination for bodily functions. Throughout that summer and over the next two years, Eric and Dave also began making prototypes of down products in their dorm room. Their first products were a down vest, a sweater and a parka and, later, three down sleeping bags. In the spring of 1974, Marmot the company was born. 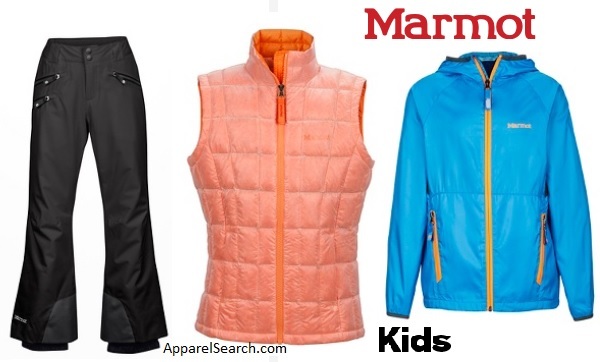 Learn more about Marmot kids clothing. Did you know? The name 'Marmot' refers to a group of highly social, large ground squirrels that live in mountainous areas. If you have changed your mind and do not wish to research the brand Marmot, you can use the search engine on this page to find another clothing label that may be of more interest. Apparel Search is a leading guide to fashion, style, clothing, glam and all things relevant to apparel. We hope that you find this Marmot page to be helpful.